Comment below if you avoid JCPenny. Bam, I think that just resonated with a lot of my readers. We often think of JCPenny as 1) outdated, 2) dingy, and 3) our mother's favorite store. But behind the 1970's brown & white storefront and sticky carpeting we can actually find a few *trendy* treasures. That's right-- JCPenny is never too far off the mark when it comes to the season's trends. You haven't seen them? Here's the trick-- shop in the Misses sections. Avoid the Juniors sections and the (old) Women's sections at all costs. Another secret-- never pay full price for anything at JCPenny, because within 2 weeks it will be marked down by 40-75%. Amazing. Also note-- JCPenny always has more discounted inventory in small sizes (2-8) since most of their target market is between sizes 10-18. 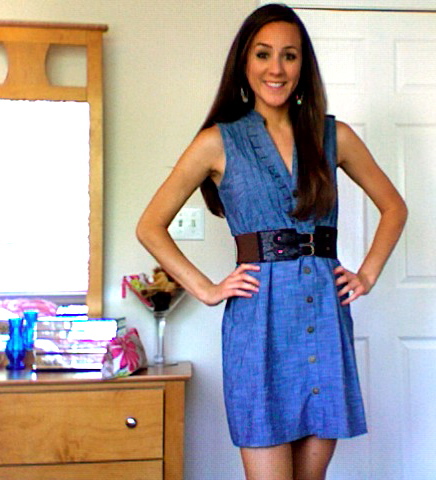 Check out this denim dress I got marked down from $72 to $17.99. The removable belt came with it, and honestly, the belt alone could have been $17.99. If you have brown hair or blue eyes, this dress would be stunning on you. It's still in stores, so get it fast! As for jewlery, I chose not to necklace because of the busy neckline, and I chose not to wear a bracelet in order to keep the focus on the belt. 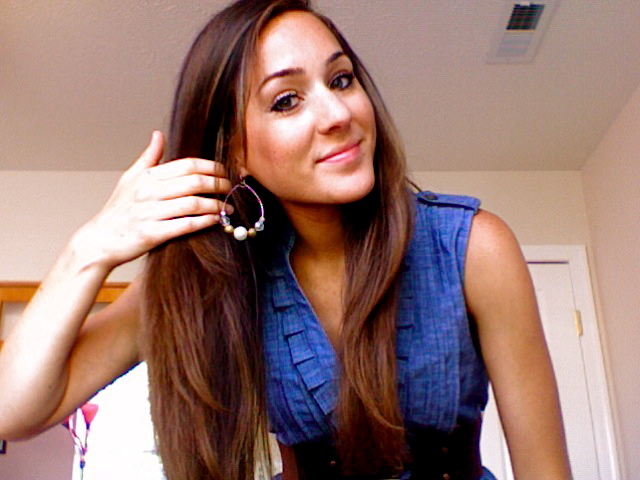 Instead I went for some simple hoops from Forever21 ($2.80) to coordinate with my brushed-gold sandals. Hope you like! I might do more of these posts in the future.